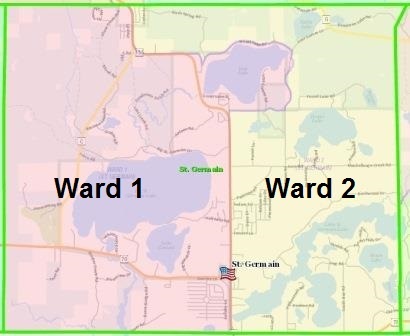 NOTICE IS HEREBY GIVEN that there will be a Spring Election held in the Town of St. Germain on Tuesday, April 2, 2019. Any qualified elector who has not yet registered to vote may do so by contacting Thomas E. Martens, Town Clerk, P. O. Box 7, St. Germain, WI 54558 or by calling at 715-892-5748. Any qualified elector who is unable or unwilling to appear at the polling place on Election Day may request to vote an absentee ballot. A qualified elector is any U.S. citizen, who will be 18 years of age or older on election day; who has resided in the ward or municipality where he or she wishes to vote for at least 10 days before the election. To obtain an absentee ballot you must make a request in writing. You must also include a copy of a photo ID. Requests by mail may be sent to the town clerk at, P.O. Box 7, St. Germain, WI 54558 and must be received no later than 5:00 P.M. on Thursday, March 28, 2019. Absentee ballot applications may be downloaded from the town web page www.townofstgermain.org. To vote in person at the clerk’s office contact the town clerk by calling 715-892-5748. The deadline for voting at the clerk’s office is 5:00 P.M. on Friday, March 29, 2019. All voted absentee ballots must be received by the close of the polls on election day. The polling place will be open at 7:00 A.M. and will close at 8:00 P.M. If you have any questions concerning the polling place, contact Thomas E. Martens, Town Clerk, P.O. Box 7, St. Germain, WI 54558, or call 715-892-5748.